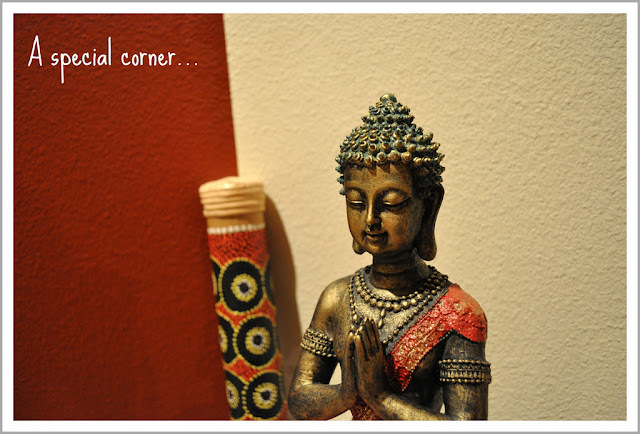 My Dream Canvas: Agastya - Nirmala's haven! I am always happy when I have a home tour to share with you. Homes of real people with their own individual personalities. A space to call your own, a haven for you and your thoughts. A place to share your life with your loved ones. "The first house that we lived in was of an apartment and I remember being proud of the fact that it is MY house and loved every bit of making the house into a HOME! 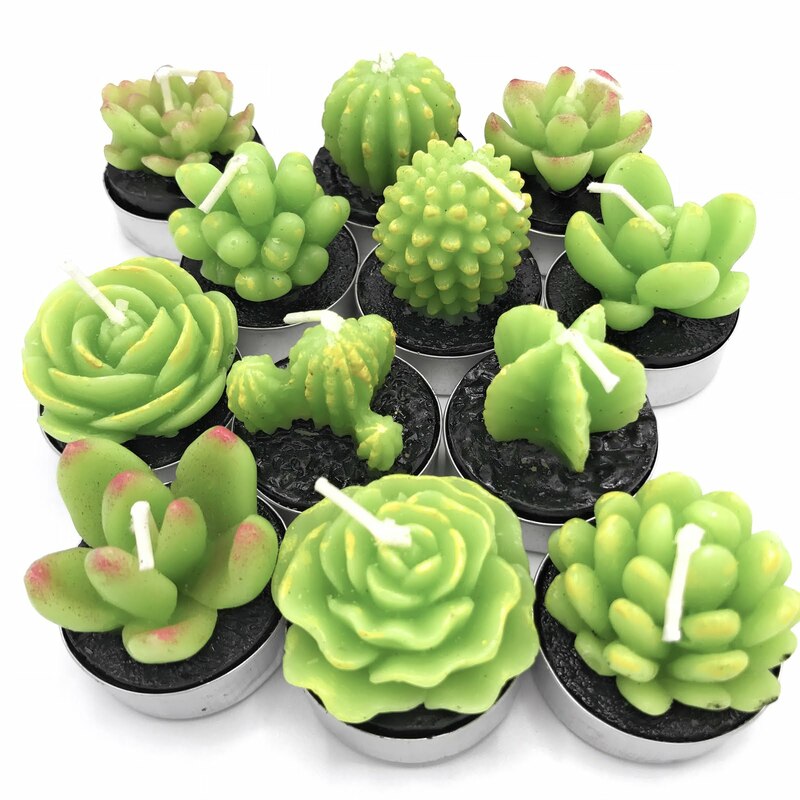 Infact i started shopping for MY home even before the wedding....I didn't quite know what my style was then, I just loved setting up and decorating the house with beautiful things. My sense of style as far as decorating goes, has always been eclectic, mix of styles although primarily ethnic. I love earthen tones as I love the warmth and coziness it spreads. 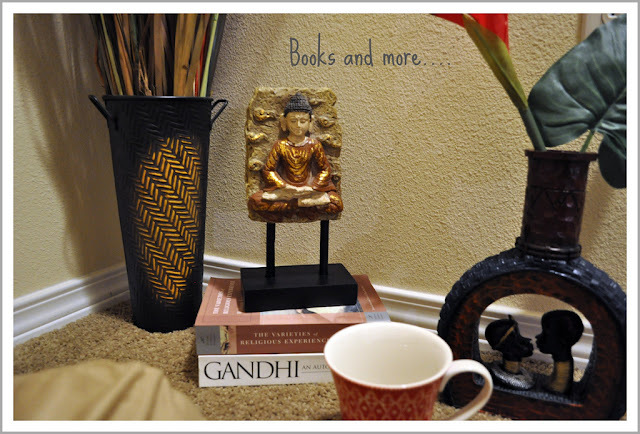 My style of decorating has matured over the years, thanks to HGTV and beautiful bloggers like Anu (thank you so much Nirmala...that's really sweet) I love Buddha statues and lately have become obsessed with them! I cannot help but buy any beautiful Buddha statue that I spot. The orange Buddha in the family room is one such lucky find and it is my priced possession." Nirmala's pretty home reflects her warmth and her passion for decorating. Nirmala admires Moroccan decor. She says that she has tried to incorporate it in the family room with her choice of colors. She took the risk of choosing 4 different wall colors for one big space ( family room/ dining/ kitchen) and it turned out beautiful. I have to say that this is one of the prettiest Buddha statues I have seen.....this image is my favorite shot of her house! This image of Nirmala's house during Navaratri is lovely. The display of Golu (dolls) during Navaratri is a popular tradition in parts of South India. Nirmala remembers it being a grand affair in her mother's house and carries on the tradition here in the States as well. I have not been able to share all the images of the festival but I can assure you that they are gorgeous! I do hope you have enjoyed visiting Nirmala's home. Thank you Nirmala for inviting us to Agastya! Please feel free to leave comments for Nirmala in the comment section and I will share them with her! Beautiful house!! love the Buddha Statues. Thankyou Sudha (from designenthusiast.blogspot.com). Your comments mean so much to me. Thrilled to hear these words from a wonderful interior decorator and a blogger. 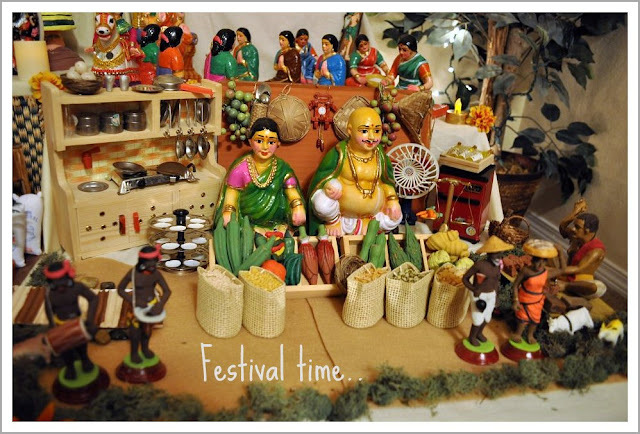 I am so glad you liked the golu, I am sure you would be celebrating it as well. The kitchen set in the chettiar's hotel is from india. My mom got it for me from Bombay. Lovely home... Love all the knick-knacks that are tastefully arranged and displayed... !! 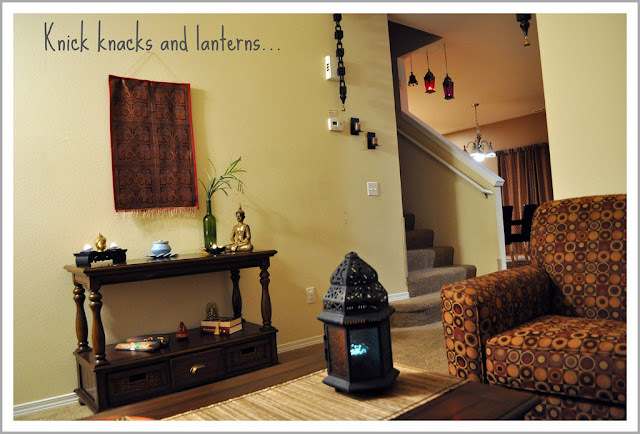 Love the coffee table , the colorful lanterns and the seating arrangements...!! I loved the center table with wicker storage baskets beneath. Wonder where I will get the kinds in India. Beautiful home Nirmala! I love the colour scheme. Thanks for all the lovely comments everyone:) makes me feel so proud of myself. Such a cozy... pretty.. home!! Well done Nirmala.. it truly looks lovley!! So happy to read that coming from you Patty! 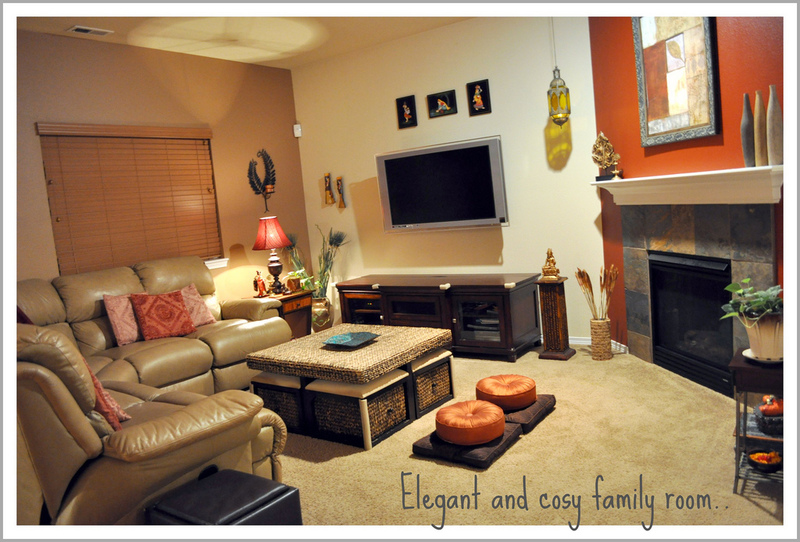 A beautifully done-up home!Loved the orange Buddha statue and the golu display! OMG!! this is soo beautiful! Totally my style! Is this here in Seattle? @Manju - Thankyou:) Yes, I am from Seattle.